What Would Happen … ? This Sunday’s New York Times has an editorial by Lee Siegel about refusing to repay one’s student loans, as Siegel himself has done. He suggests that if only more people would follow his example, a long sequence of good things would start to happen. At the end of this sequence, like the pot of gold at the end of the rainbow, we will find affordable higher education. If people groaning under the weight of student loans simply said, “Enough,” then all the pieties about debt that have become absorbed into all the pieties about higher education might be brought into alignment with reality. Instead of guaranteeing loans, the government would have to guarantee a college education. Sounds nice. But it might perhaps be a slight bit optimistic. Categories: debt, educational debt, loan | Tags: educational loan default, lee siegel | Permalink. According to Susan Dynarski and Judith Scott-Clayton, the FAFSA could consist of just 2 questions and more people would manage to go to college and stay there until they get their degree (The Cost of Complexity in Federal Student Aid). One last question: how do you fix that? Categories: educational debt, loan, tuition | Tags: boomerang kids, dynarski, FAFSA, scott-clayton, student financial aid, student loans, underemployment, unemployment | Permalink. 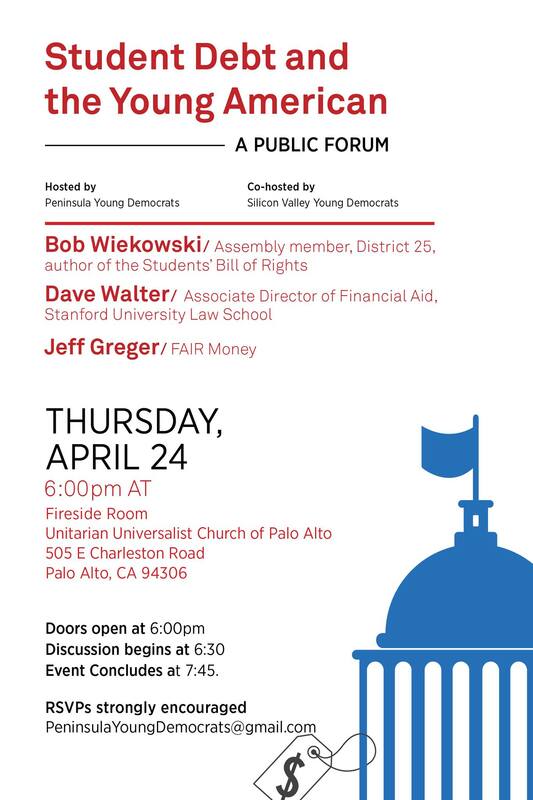 Jeffrey Greger of the FAIR Money team will be joining Assemblymember Bob Wieckowski (author of the Students’ Bill of Rights), and Dave Walter (Stanford Law School’s Associate Director of Financial Aid) this Thursday in Palo Alto for a public forum on student debt. We encourage you to take part if you’re available, and look forward to seeing you there! Thursday, April 24, in the Fireside Room at the Unitarian Universalist Church of Palo Alto, 505 E Charleston Road, Palo Alto, CA 94306. Categories: educational debt | Permalink. How Exactly Do Colleges Allocate Their Financial Aid? They Won’t Say. Many universities have access to comprehensive financial profiles, sometimes down to the type of cars a family drives. Some analyze patterns and interpret even the most subtle indicators from students, such as the order in which schools are listed on the federal financial-aid application, or even how long a student stays on the phone with an admissions officer. The full article is well worth your time. Categories: educational debt | Tags: educational loans, financial aid, student debt | Permalink. In a New York Times op-ed on the self-reinforcing nature of inequality, Robert Frank writes “perhaps the most import new feedback loop shows up in higher education. Tighter budgets in middle-class families make it harder for them to afford the special tutors and other environmental advantages that help more affluent students win admission to elite universities. Financial aid helps alleviate these problems, but the children of affluent families graduate debt-free and move quickly into top-paying jobs, while the children of other families face lesser job prospects and heavy loads of student debt. All too often, the less affluent experience the miracle of compound interest in reverse.” (See full article, The Vicious Circle of Income Inequality.) What does that mean for higher education? Frank proposes that “we’ll want to think more creatively about public policies that might contain” any of the feedback loops that increase inequality. How about a little more self-scrutiny and creative thinking on the part of institutions of higher education? Categories: educational debt, inequality, loan | Tags: feedback loops, higher education, rising inequality, self-reinforcing, social mobility, social rigidity | Permalink.